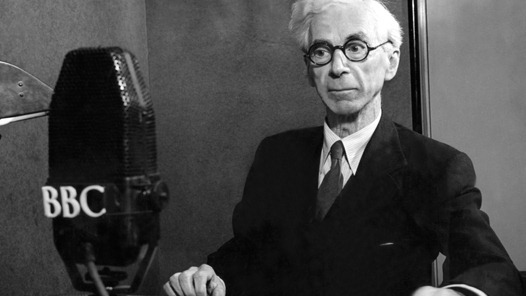 Bertrand Russell: First Media Academic? Unfortunately, I missed the chance to hear this broadcast; but fortunately, many of Russell’s BBC broadcasts are still easily downloadable. I suppose as good a place to start as any is with Russell’s 1948 BBC Reith Lectures. (These can also be downloaded from the Reith Lectures podcast page). This also reminds me of the Richard Posner’s study with its highly judgmental title: Public Intellectuals: A Study of Decline. Bertrand Russell was one of the greatest thinkers of the last century. His contributions to the field of mathematics and philosophy are still widely acknowledged as some of the most important of their kind. But, as Robin Ince discovers, he was also arguably one of the first great media academic stars, who brought his own brand of rationalism and intellect to an audience far beyond the academic and political circles he routinely mixed with. His relationship with the BBC goes back almost to the beginning of its own history, and his many broadcasts and appearances on radio, in particular, brought his ideas to a whole new audience. He delivered the very first Reith Lectures back in 1948, and was a regular panellist on the hugely popular The Brains Trust. His thoughts on themes ranging from education, through to nuclear armament and religion, were regularly broadcast on the BBC, right up to the end of his life. Robin Ince takes a listen back to some of Russell’s great contributions to broadcasting and looks at the life of arguably the first great media academic. In the unlikely chance that any of this blog’s readers might have a lead how I might be able to hear Bertrand Russell: First Media Academic?, could I ask you to leave a comment below? My thanks in advance. Update: I would like to express my sincere thanks to Tom Stanley of the Bertrand Russell Society Library, for giving me this link to the BBC broadcast in the comments below. Thanks for the link to the broadcasts. I’m a huge Russell fan and would also love to hear the “First Media Academic” broadcast. I’ll see what I can find. Thanks Kris! I should have mentioned that there are also transcripts of those lectures. Tom — wow, thank you so much for letting me know about that (and so quickly after I posted my query. I am indebted to you.